McLaren has taken significant strides to overturn its on-track fortunes by promoting teenage Lando Norris into the hot seat as part of its new driver line-up for 2019. The team, partly-owned by Bahrain’s sovereign wealth fund Mumtalakat, has struggled in recent years with an uncompetitive car, leading to disenchanted star Fernando Alonso leaving the sport to pursue winning opportunities in other series. Belgian Stoffel Vandoorne has also been dropped after a number of unconvincing performances. Spaniard Carlos Sainz will join Norris in the cockpit after moving from Renault. Norris is a title challenger in the Formula 2 feeder series this year, sitting second in the championship having won on his debut from pole position. 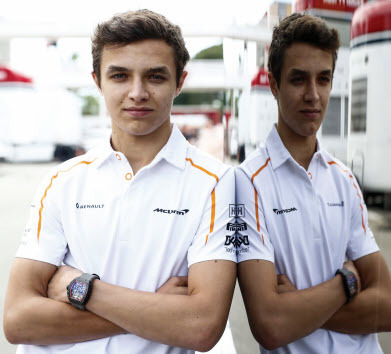 Since joining McLaren’s Young Driver Programme in early 2017, Norris has conducted race simulation work for the team in addition to participating in testing. “For the remainder of 2018, my focus remains firmly on the Formula 2 championship,” he said. “My objective is to win the title before joining McLaren full-time, which will be tough, but I will fight as hard as I can for the remaining four races. Comparisons have been made with Lewis Hamilton, who also joined McLaren as a rookie in 2007, missing out on the title by one point but subsequently becoming one of the most successful drivers in the history of the sport. However, Norris remains level-headed about his chances, and is under no illusion that the papaya orange McLaren he will be stepping into is far from the front-runner that Hamilton’s silver arrow was more than a decade ago. The teenager, from the English city of Bristol, said: “Growing up, I’ve always watched Lewis and aspired to have some attributes from him, mainly his speed. His raw pace is probably the best of everyone on the whole grid, so there are bits you want from different drivers. And being compared to someone who could be about to win five world championships, who’s won four, it’s not a bad thing. “Rule Number One is beat your team-mate. Apart from that, it is going to be a tough year. We are not going to be winning, or competing against Ferrari and Mercedes. I would like to think we can make a step forward from where we are, however. “As much as I would have loved to partner Fernando, as much as I admire him and loved working with him, for the longevity of McLaren and helping them improve, having Carlos will mean we can push each other a lot together. “Fernando would definitely help the team improve but it is good that teams have fresh starts every now and again. I don’t think it’s a bad or good thing I’m going against Carlos. Whether Norris forges a successful career or not will depend on both his ability behind the wheel and his team to provide him with a competitive car. McLaren chief executive officer Zak Brown said he had promoted Norris because he was ‘convinced he is a star of the future,’ but at the same time admits that the team has a responsibility to nurture that talent. He explained: “McLaren are in rebuilding mode, and to have two extremely quick young drivers, one with a good amount of experience, one inexperienced, is a good combination, considering the five-year horizon. We pretty quickly got to the conclusion that Lando was the right driver.